There are many people who feel that if you are a Christian you should never have a single doubt because they see doubt, even a transient doubt, as proof that you are neither solidly grounded in your faith nor established fully in God. These people fail to distinguish between the different types of doubt and lump them all together and regard them as the opposite of faith and therefore sin. They are quick to point out that the Bible says, “…Whatsoever is not of faith is sin” (Romans 14:23). For example if someone falls sick will God heal him and put him back on his feet? This someone is a strong, Bible believing, faith filled committed Christian and he has been seriously sick before and in response to his prayers God has graciously healed him. But now he is gravely sick, 79 years old and he has some doubts if God is going to heal him this time. Is his doubt in this case the opposite of faith and therefore can be called sin? Before we answer this let us examine closely this specific situation. We know God can heal the sick and faith-healing among Christians are normal and continues daily and this 79 year person has demonstrated his faith in prior situations and been healed as a consequence. This means that he has no doubts either in God’s ability as Jehovah Rapha the lord our healer as per Exodus 15: 22-26 or as expressed by Jesus’ performance when it is recorded, “…and all they that had any sick with divers diseases brought them unto him; and he…healed them” (Luke 4:40). No his doubts are in a different domain. He is familiar with the scripture that tells us that some sickness will lead to death, and some will lead to full recovery and his dilemma, which is the core of his doubt is whether or not this is his time to depart this world, i.e. to die. Christians operate on the treble-check (or tripartite) principle; first conscience (moral emotion, prickly sense of acute unease), second calculation (clear and coherent thinking i.e. reason) and third Holy Scriptures (the Bible). To establish harmony the process should always begin and end with the Holy Scriptures and work backwards. We must always start with the Bible for this is the inexorable mind of God and final authority presented in literary form (as opposed to oral transmission) and is the ultimate measure of truth in all its manifestations. This is the very reason why it is expedient that we are familiar with the doctrines of the Bible and why we study it day and night for inspiration and guidance and submit our lives to be shaped and molded by its godly influences. We start with the Scriptures and work through calculation to fully appreciate God’s reasonableness and as long as our thinking is clear and coherent our conscience (that is the product of knowledge and education) finds accommodation and anchorage. This is something that people apart from God, non-believers generally but atheist and their fellow travelers in particular, cannot understand. The latter muddy the waters of calculation with their false science, they throw in the rocks of conjecture and hypothesis that is here today and gone tomorrow and they constantly misrepresent reality in a skewed fashion to suit their ideology and yet they are surprised that people still cling to the concept of God as fiercely as before. Undoubtedly these academic atheists have the ability to confuse feeble minds and those on the periphery of Christianity but you cannot derail the gospel train by throwing conjecture and hypothesis at it. What you will need to do to successfully derail this train is first to utterly destroy the Holy Scriptures and the residual knowledge permeating mankind. This was tried in the past, just check with the Soviet Union communist for example, and it was a monumental failure. Then having done that you would have to find a way to prevent future generations from being born with the imprint of God-consciousness and the irresistible urge to seek answers beyond the material. In the absence of success in these endeavors Satan and his allies engage in creating doubts to weaken the resolve of believers. Doubt persists when one or more elements of the treble-check principle i.e. our conscience, our reason or our understanding of the Scriptures are out of sync. These three must merge in effortless harmony for doubt to be demolished and by staying merge leave no fertile ground for doubt to germinate. But doubt can have an elusive, nagging quality; something you can’t quite get hold of but it is there unfocussed and menacing waiting to come into focus on specific occasions and relative to certain events. A believer can be solid in God, profoundly faithful and trusting and along comes an event, like the death of a child, and suddenly huge doubt emerges and the believer asks, “Where were you God when my sick, innocent child needed you?” There are many answers here and the true believer through reflection and quiet, Spirit-filled meditation will access them and be comforted by them as time goes by. But this doubt will pass, will perish due to the lack of spiritual oxygen, and will be seen in time to be nothing more than a blip on one’s spiritual radar but another doubt will arise and then another for such is the substantive flotsam through which we must travel to reach our desired destination. Successful living does not happen by chance but by the application of knowledge and skills under the Holy Spirit's constant inspiration. 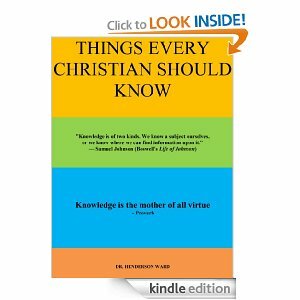 The Bible tells us, "My people are destroyed for lack of knowledge" (Hosea 4:6) Some of this knowledge is here documented to assist believers as they journey along.